MINI will launch its first plug-in hybrid next year, adding the drivetrain from the BMW 225xe Active Tourer to the new, larger Countryman crossover from June. The MINI Coooper S E Countryman will offer CO2 emissions from 49g/km. 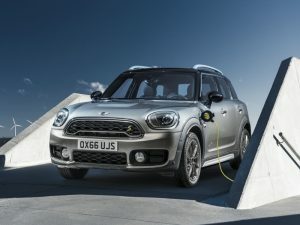 The Cooper S E Countryman is the brand’s first production electrified vehicle, though the last-generation MINI hatch was used as a test bed for the BMW Group’s electric drivetrains with a fleet of battery-electric MINI-E prototypes deployed in the UK in 2011. Launching four months after the petrol and diesel versions, it uses the same drivetrain as the BMW 225xe Active Tourer. The front wheels are powered by a 136bhp 1.5-litre turbocharged three-cylinder petrol engine from the Cooper Countryman, the rear wheels from an 88bhp electric motor under the boot floor. Fully charged using the port on the wing, which takes just over two hours, the 7.6kWh lithium-ion battery carries enough energy to offer a 25-mile electric range, contributing to 49g/km CO2 emissions and fuel economy of 134.5mpg on the NEDC for plug-in hybrids. Combining petrol and electric power produces 221bhp, four-wheel drive and enables a 6.9-second sprint to 62mph. As an homage to the MINI-E, the Cooper S E Countyman is marked out with yellow accents, with equipment levels and body styling likely to follow the Cooper S and Cooper SD. It joins a repositioned Countryman range, which will put MINI up against the Audi Q3, BMW X1 (with which it shares its platform and most of its engines), Mercedes-Benz GLA-Class and Range Rover Evoque. The launch range comprises two petrol and two diesel engines, with CO2 emissions from 113g/km and fuel economy of up to 64.2mpg.